It’s not every day that you get to see two former guitarists with Muddy Waters‘ band perform together on the same stage, backed by an all-star band of some of the top names in the blues music world. And while a event/catering center in Columbus, Ohio, may not seem the most likely of settings for such a historic gathering – indeed, this was a show you could just as easily imagine taking place in one of New York’s or perhaps Chicago’s marquee theaters – you really have to commend the organizers of the annual Project Blues Review for assembling such a superb line-up of blues acts, not just in terms of the fantastic, one-night-only Muddy Waters Tribute but with an entire evening of solid performances. Now in its fourth year, the Project Blues Review is also a fundraiser for the Columbus Cancer Clinic, a division of the LifeCare Alliance that provides education, screenings, examinations and various other services for cancer patients throughout Central Ohio. In addition to the proceeds from ticket and merchandise sales, the evening also included an auction of custom-made and signed memorabilia such as guitars, harmonicas, posters, and t-shirts that helped to bring in several thousands of dollars more to benefit the cause of diagnosing and fighting cancer. 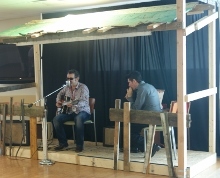 The music began mid-afternoon with a rich acoustic “back porch” set from Columbus native and 2007 International Blues Challenge (IBC) winner Sean Carney and harmonica player Bob Corritore, playing on – literally – an indoor back porch constructed by a local builder for just this occasion and hitting on such blues classics as “That’s All Right”, “Ramblin’ on My Mind”, “C.C. Rider”, “Kindhearted Woman”, “Take a Little Walk with Me”, “Key to the Highway”, and Robert Lockwood’s “Western Horizon” as well as Tom Waits’ “Chocolate Jesus”. 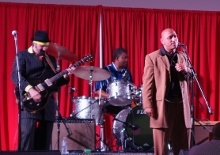 Local band Deuce ‘n a Quarter kept things rolling with a tough, often soulful, swinging set that included originals like “Bust That Boogie” and covers such as “Wasn’t My Time to Go” (James Cotton/Keb’ Mo’) before wrapping up with a most fitting encore of “Healing Power of the Blues”. 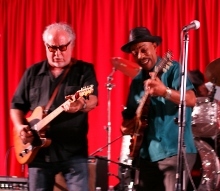 Carney returned to the stage for another shared set, this time with Texas guitarist and fellow IBC winner (2005) Jonn Del Toro Richardson, with the pair taking turns on vocals and solos through a number of songs off their 2013 album Drivin’ Me Wild, including a Carney-sung “Come on With It” and Richardson on vocals for “Peace of Mind” and “Shake That Thang”. But the real highlight of the set came at its close with the duo’s electrifying cover of Johnny “Guitar” Watson’s “Looking Back” during which Richardson and Carney both played on Carney’s guitar simultaneously and then swapped guitars, with Richardson at one point also leaning down to play Carney’s guitar as Carney lay on the stage on his back. 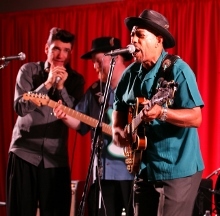 Richardson retook the stage a short time later – joined now by fellow Project Blues Review musical host, Chicago guitarist Tom Holland (James Cotton Band, Tom Holland & the Shuffle Kings) – as they together welcomed Portland, Oregon vocalist Karen Lovely. Kicking off with a cover of California bluesman BB Chung King’s driving “Company Graveyard”, Lovely led the band through a forceful set featuring songs like Howlin’ Wolf’s “Who’s Been Talking” and a funky take on O.V. Wright’s “Don’t Let My Baby Ride”, also introducing a new original train song inspired by Johnny Winter in “Heard the Whistle Blow” before inviting Bob Corritore to accompany on the slow, stinging “Glad You’re Gone” and then also adding Muddy Waters band guitarist Bob Margolin to the mix for “Death Letter Blues”. 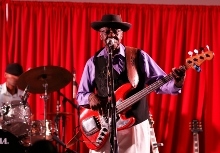 Margolin stayed on to serve as host for the headlining Muddy Waters Tribute, first introducing pianist David Maxwell and drummer Kenny “Beedy Eyes” Smith, who combined for a lively instrumental to open the set. They were soon joined by Corritore and famed Chicago blues bassist Bob Stroger, with Margolin belting out “Screamin’ and Cryin'” – Muddy’s favorite song of the ones he himself wrote, according to Margolin – followed by a confident “I’m Ready”. Cancer survivor Stroger was the next to take a turn on vocals, starting with the shuffling “Talk to Me Mama” and then “Come on Home” from his new CD with Smith, Keepin’ It Together (read our review of the CD here). Next it was on to Smith for a song, which he dedicated to his father, Muddy Waters band drummer Willie “Big Eyes” Smith, in the creeping “What Cha Say” – also from Keepin’ It Together, calling Holland to the stage midway through the number. As great as the set already was, things only got better with the addition of guitarist and Muddy Waters band alumnus John Primer to the group, with Primer taking vocals on songs such as the classic “Mean Old World”, his original “Going Back to Mississippi” and Waters numbers like the crawling “Take the Bitter with the Sweet” and mid-tempo “Close to You”, closing the set with a magnificent “Got My Mojo Working” on which Stroger also joined on vocals, incorporating a little “Keep Your Hands Off Her”. The band returned for a one-song encore, an inspirational tune about sticking together so that no one gets ahead of you, with Primer (a thyroid cancer survivor) even inviting his young daughter to sing a few lines. The only thing that might have made this tribute (more photos of which you can find in our BluesPowR Gallery) any better would have been the inclusion of Waters’ son Mud Morganfield on vocals to add a bit more of a Muddy flavor to the program, but we’re certainly not complaining – this was one hot show! Having already brought in the likes of James Cotton, Keb’ Mo’, Anson Funderburgh, Dave Specter, Rich DelGrosso, Diunna Greenleaf, Ray Fuller and the Blues Rockers, Omar Coleman, and Christian Dozzler for previous programs, with Richardson and Holland serving as musical hosts each year, the annual Project Blues Review may well have been one of the best kept secrets on the live blues scene. But with shows like this one, we imagine it’s just a matter of time before Project Blues helps put Columbus on more blues fans’ summer travel maps! This entry was posted in Shows and tagged Bob Corritore, Bob Margolin, Bob Stroger, David Maxwell, Deuce 'n a Quarter, John Primer, Jonn Del Toro Richardson, Karen Lovely, Kenny Beedy Eyes Smith, Muddy Waters, Project Blues, Sean Carney, Tom Holland. Bookmark the permalink.